The Powerline AV Utility is used to set up security for the Powerline Fast Ethernet adapters and upgrade their firmware. To install the utility on your Mac® computer, follow the instructions below. QUICK TIP: If you do not have the Setup CD, you can download the utility from the product’s support page at Linksys Support Site. For more instructions, click here. Double-click the Setup CD icon on the desktop to extract the WireConf PLC v1.0.0.0.pkg installer. Double-click the extracted file to run the installer. On the installer’s Introduction page, click Continue. 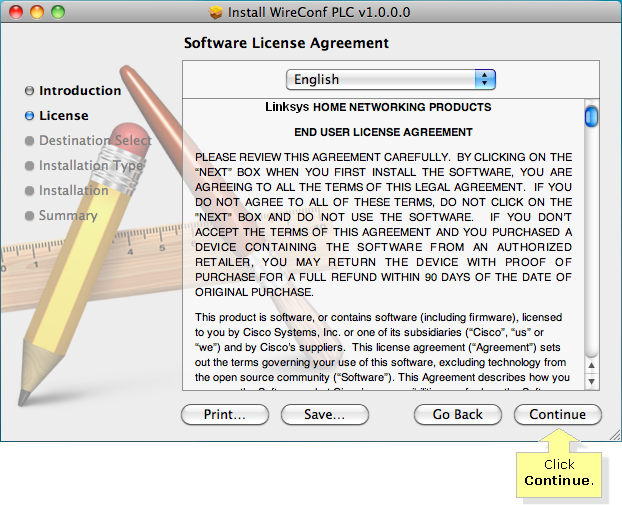 Read the Software License Agreement and click Continue. You will be informed on the amount of space the utility needs and on what hard drive it will be installed. Click Install. NOTE: You can click on Change Install Location… if you want to change the location where the software will be installed. You will be asked for your computer’s name and password. Enter the necessary information in the fields provided and click OK.
You will be then informed that the installation is complete. Click Close to finish the installation. QUICK TIP: To access the configuration utility, go to the Hard Drive device > Applications > WireConf.